Rasika, cold, happy new year! Vickey & I have been friends for almost ten years. 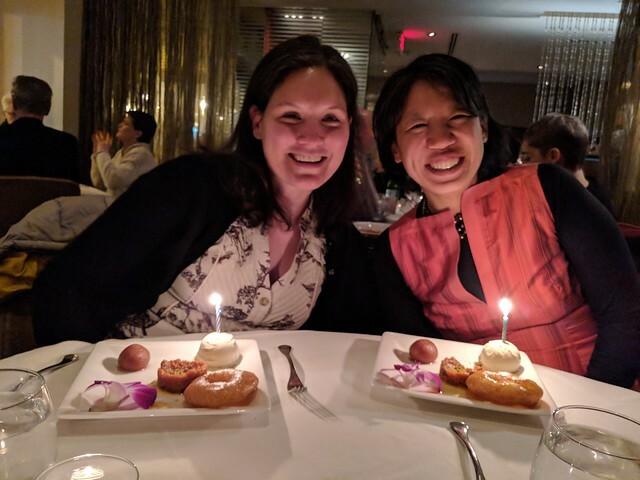 We both had milestone birthdays (I'm the older one, Vickey is the youthful one) this year and the goal was to go out to celebrate sometime between our birthdays. We just squeaked in under the wire, we went out to dinner on Thurs and Vickey's birthday was on Friday. 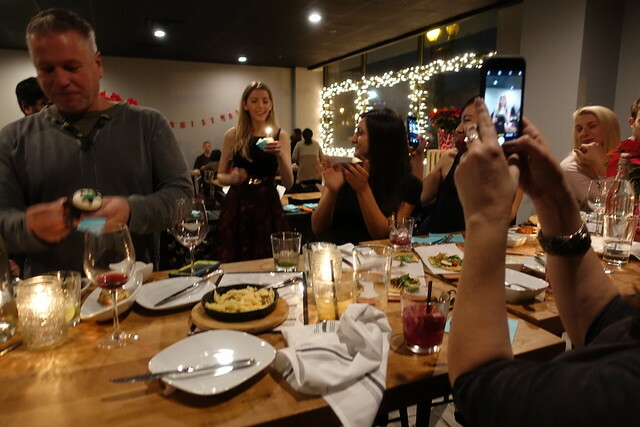 We went to Rasika - an Indian restaurant downtown. This was one of the best meals I've ever had - totally worth the price. We spent a lot of time discussing which restaurant to go to - it needed to be good value, food we couldn't make at home. A good time - both husbands were there and no children were present! Fun :) And we had a long discussion about urinals. 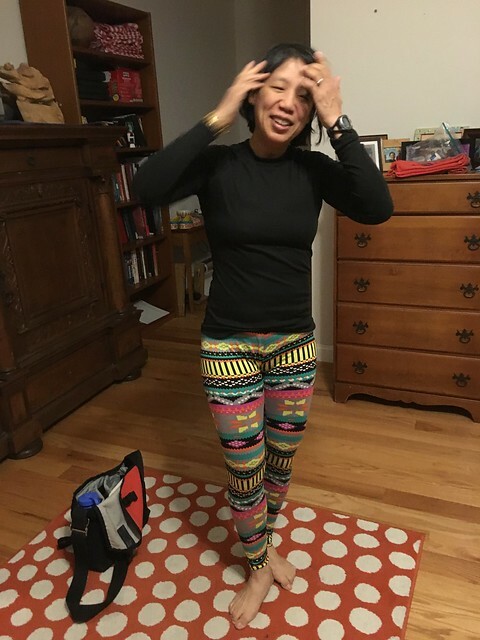 Soojung sent me 4-5 pairs of *ahem* striking leggings - the above is only one of the fine pairs. She did not want them - I told her I could wear them to the gym. And I did wear them to the gym, which was fine until I recognized a friend who was working out there as well and then I felt incredibly self conscious looking completely ridiculous. I've been running outside a lot. OMG so cold! So cold. We went to cousins tonight for dinner. 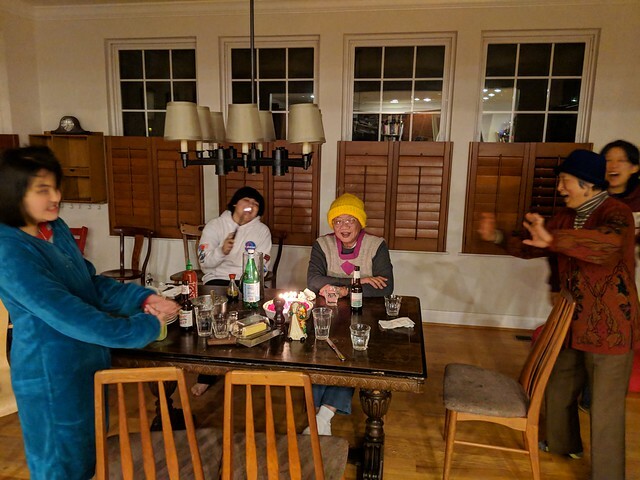 This is our last Christmas celebration - somehow the Martins were the last ones to get together. We got lots of warm fuzzy things :) Happy New Year. 2017 was tough. 2018 will be better. Mary Ann, Beef Wellington, Vidya. 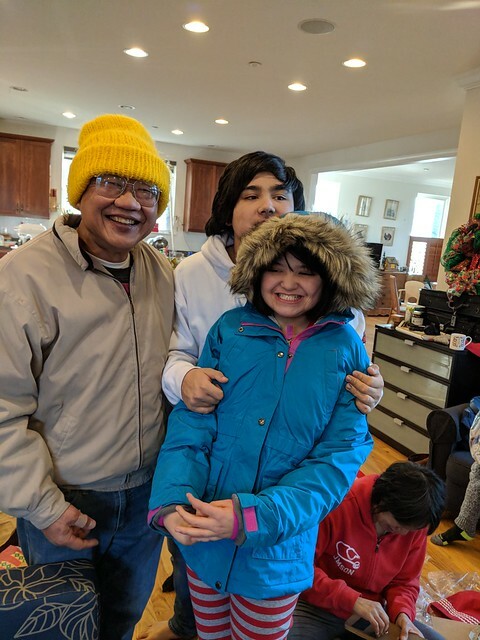 Christmas here was just the six of us, a much quieter affair than Thanksgiving. 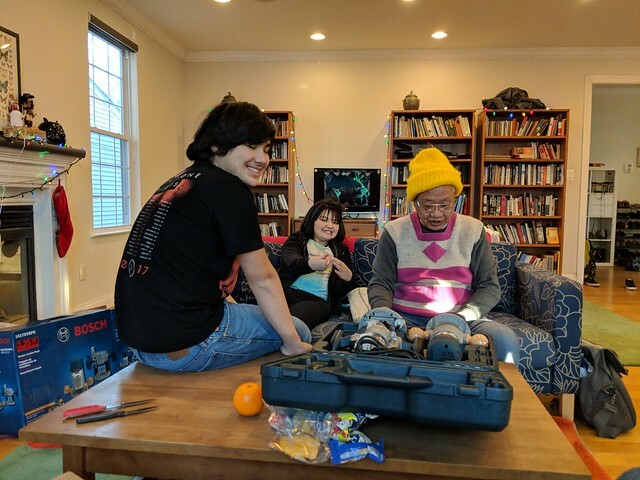 It's also my dad's birthday, so we try to amuse him (and sometimes we succeed!). 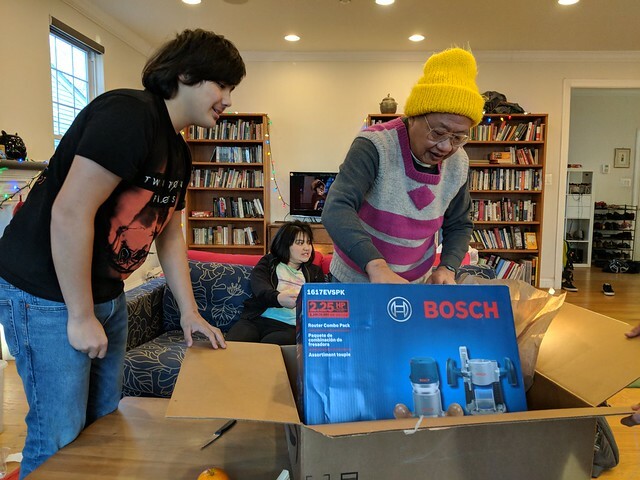 Vince's big gift this year was a Korean-speaking rice cooker. 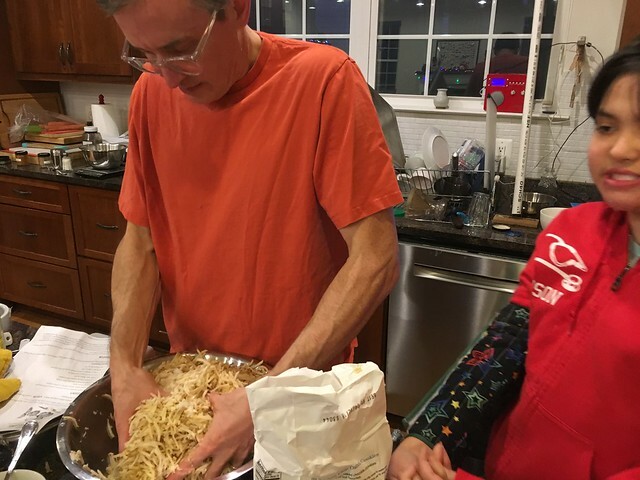 It makes white rice in a blazing 17 minutes. We will try this new fangled rice called gaba rice soon. 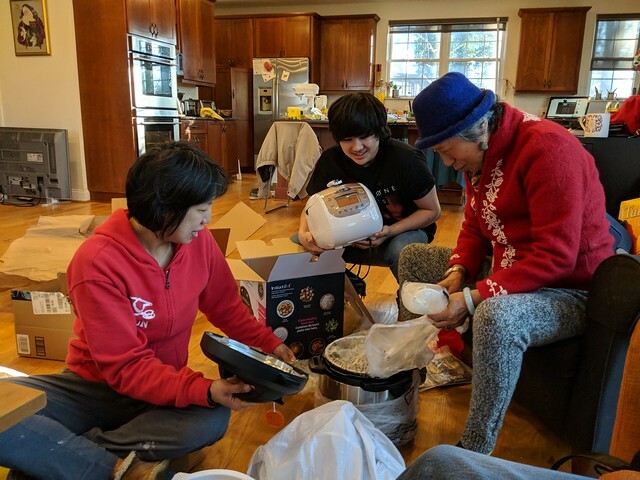 My mother got the only gift that anyone stood in line for - the instant pot. 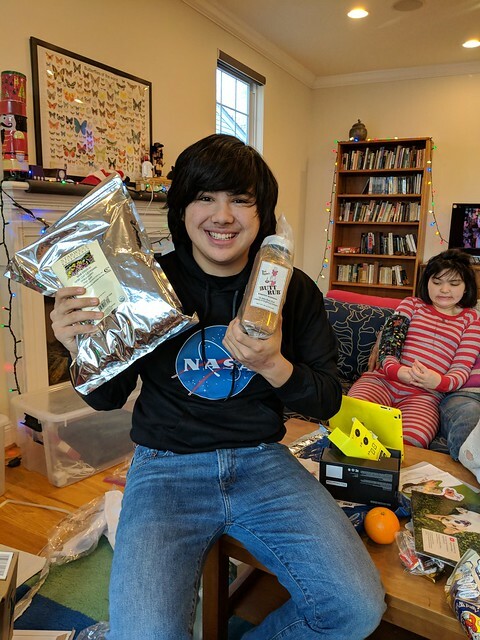 I got clever this year and mailed everything to the house under "Doris L*e c/o Christmas" so that I would know which packages were Christmas gifts and which packages were just house crap (shipped under just plain "Doris L*e") that we needed, but I did miss some - here we are getting cooking seasonings for Christmas. I did the same thing this year and left all the shipped packages unwrapped in their cardboard boxes. I'm glad I don't spend hours wrapping. 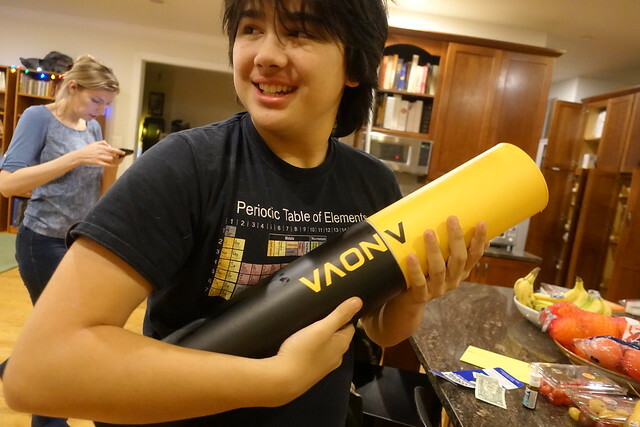 It's kind of fun having Vince open them all and then we see what it is and who it belongs to. 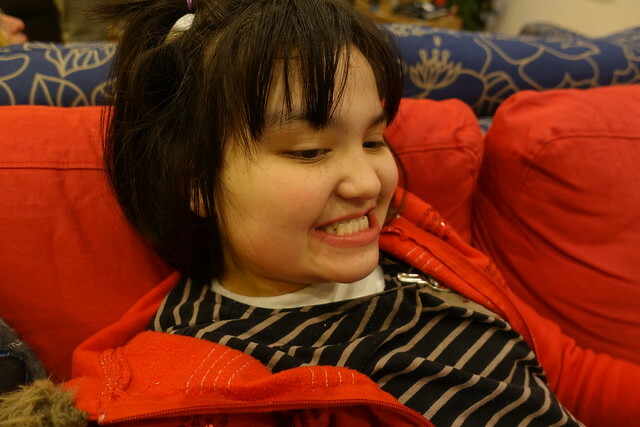 Edda had a great morning, I will post a video of her and my dad just laughing and laughing together. She got a great winter jacket. Nat and Dara came over mid-morning. Then we spent the afternoon making Christmas dinner. 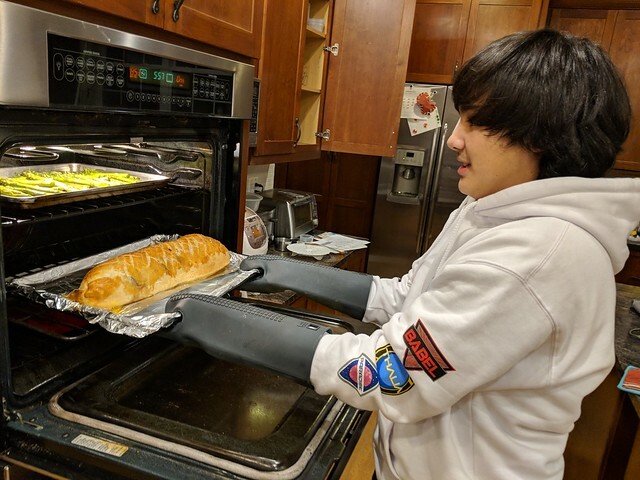 Vince wanted to make beef Wellington - he's been binge watching cooking youtube videos and this particular dish inspired him. It was a crazy extravaganza. 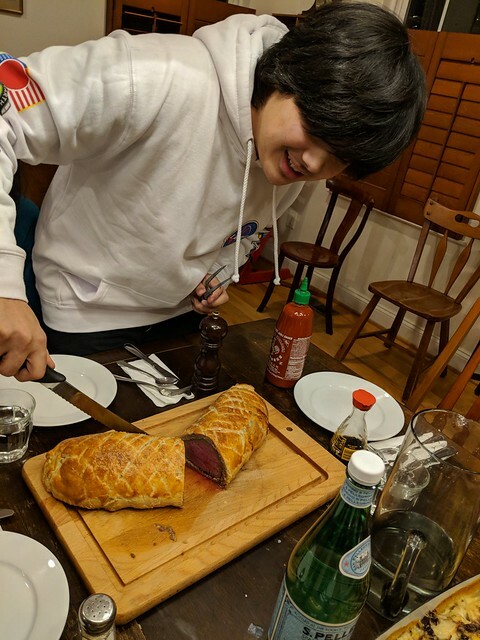 We first bought a beautiful filet roast and sous-vide-ed it the day before and put it in the fridge. 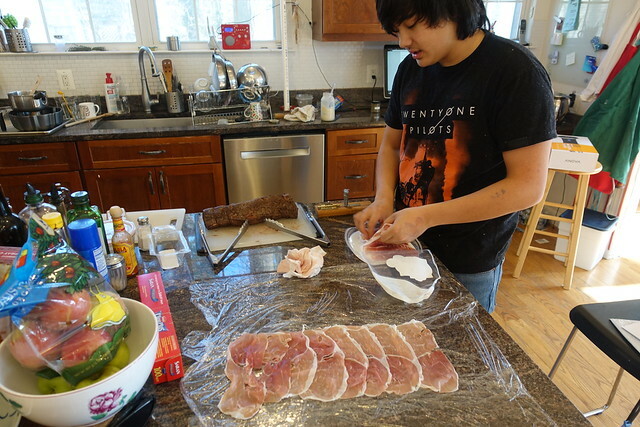 Then Vince set about making the wrap which involved layering prosciutto. 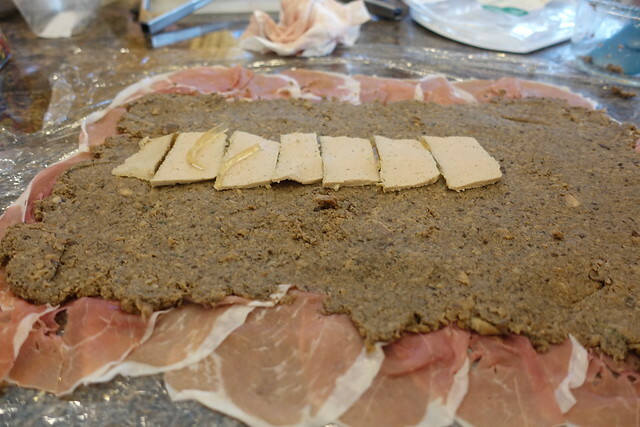 A mushroom paste was slathered on and a layer of duck liver. And then the whole thing is wrapped in puff pastry. And here it is plated. It was perfect. Delicious! The boys did a good job. I (inspired by my binge watching the British Baking Show) made a raspberry creme pie with my own press-in shortbread crust, creme patisserie and raspberry jam/sauce. 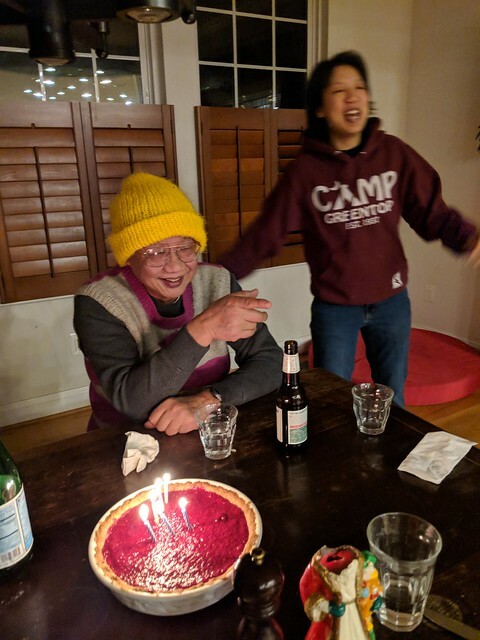 And we sang happy birthday to my dad who turned 76! I've been working on and off the rest of the week. Jeremy and Vince have been off. Edda's had camp in the afternoons. We took Wed off to all drive to see Vidya in Philly on Wed. Vince did not want to go because we were "wasting his vacation time". We tried to indulge his requests which were 1) philly cheesesteak 2) ability to explore philly on his own for a few hours and 3) he got to pick dinner plans. It mostly worked out, though it was bitterly cold and Vince explored for only 45 minutes. It was, again, nice to see Vidya. Hopeful he can be home soon, but there are many challenges. Jeremy's last day of work for the year was yesterday. He thinks he started his current job on the first business day of 2008, so yesterday closes out his decade at the same job. I started my job only a few months before him (my decade anniversary was in September), so we are getting extra nostalgic about the last ten years. We are already planning on the next ten years, both of us have professional ideas that'll be interesting to pursue and there will be big changes personally as the kids grow up and become adults. 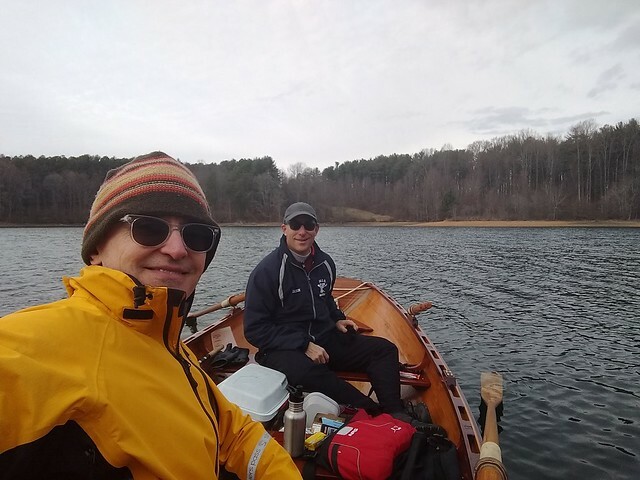 Jeremy took his first day off this holiday week (he's off all next week, I am not) and went rowing with his friend Ben. 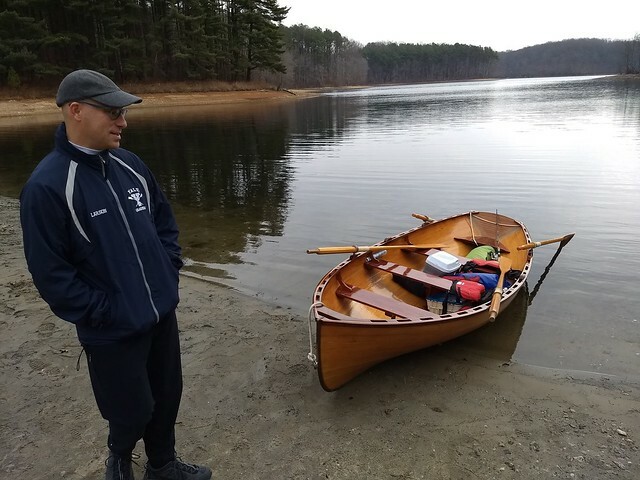 They rowed for four hours in this beautiful, handmade wooden boat. The kids had school all the way up until today - they didn't even get a half day today. 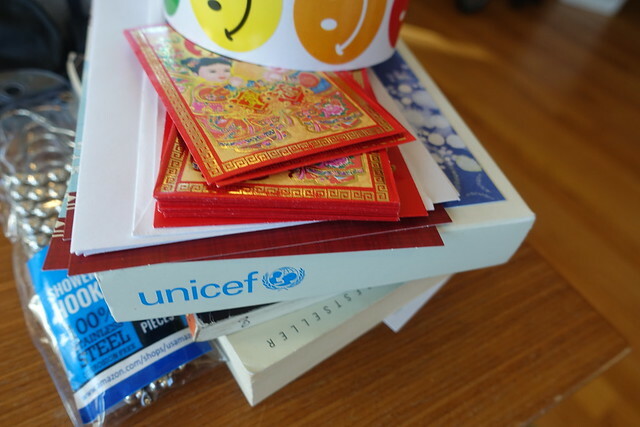 As usual, the biggest line item on our Christmas list were the teacher/caregiver gifts. I give cash so I'm always nervous about sending them off just in Edda's backpack but all the gifts made it to her school and her aftercare program. I wasn't nervous at all about sending Vince off with his, but he had more trouble as he left two cards in the lunchroom by accident and couldn't find them again. I thought maybe they would make it to his teachers as their names were written on them, but I suspect some kid is slightly richer this holiday season or they just got thrown out (because I know by lunch, the lovely bag that I sent the cards in with Vince would have appeared a smooshed, crumpled mess of a bag). Anyways, there is always a long discussion among moms about what to give - mainly is cash OK? or does it have to be gift cards? I was at the gym today lifting weights - a little extra crowded as people are home for the holidays. I mentioned this to Jeremy and he said that folks are getting ahead of their new year's resolutions, but I disagreed - the people at the gym were either the regulars I usually see or they looked like they were old pros at working out - it's just that they usually don't work out at the Rockville Swim Center. For weightlifting, I'm following an app on my phone that gradually increases the amount of weight I lift for things like squat & deadlifts. 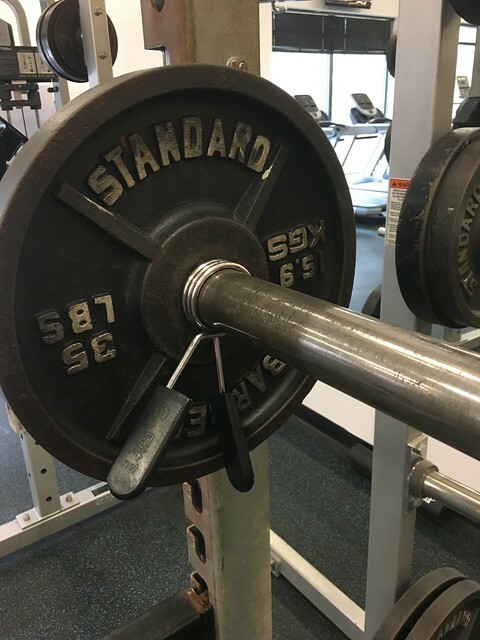 It's really slow, so I've spent months and months putting on and taking off 2.5, 5 and 10 pound plates not really paying attention to the total weight that I'm lifting & just doing the rep counts the app says - but today it got heavy enough for me to put a 35 pound plate on the bar. Look at that! I can move that thing and not totally hurt myself. 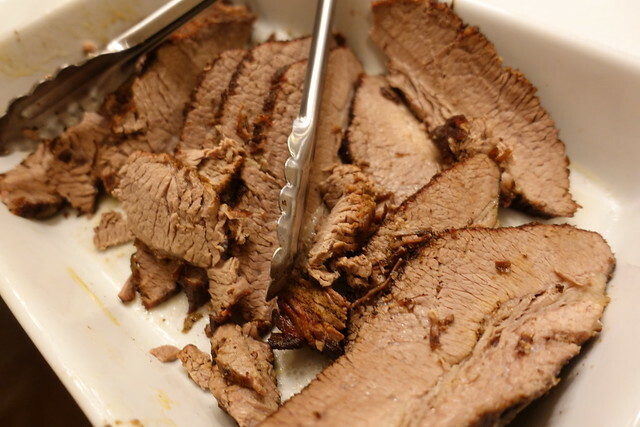 Brisket, parents, last night of Hanukkah. 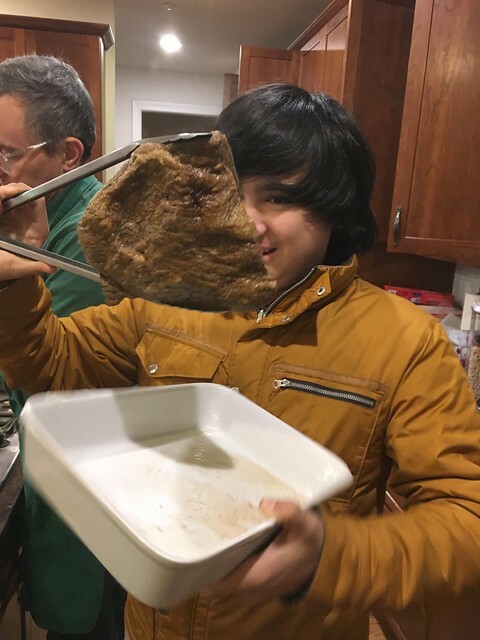 Well, we cooked the brisket for 24 hours at 155F. Well not quite 24 hours as we didn't start cooking it until 8 pm last night and we ate at 6:30 pm tonight and we might have lost a few hours during the night last night when too much water evaporated from the pot that the sous-vide-er turned off. It was a large piece of meat which was intended to feed a bunch of people, so we needed a bunch of people over for dinner. 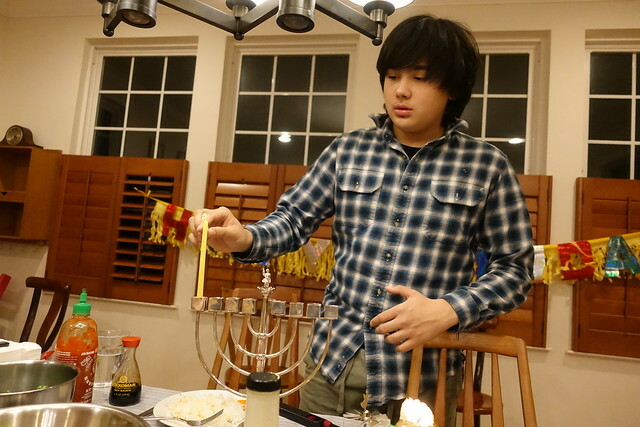 We invited my parents and we all celebrated the last night of Hanukkah. Was it amazing? It was pretty good, but I'm not sure I'd call it AMAZING. I think it needed another 12 hours, it hadn't gotten to that melt in your mouth texture yet. It's so weird to cook meat for 24-72 hours. 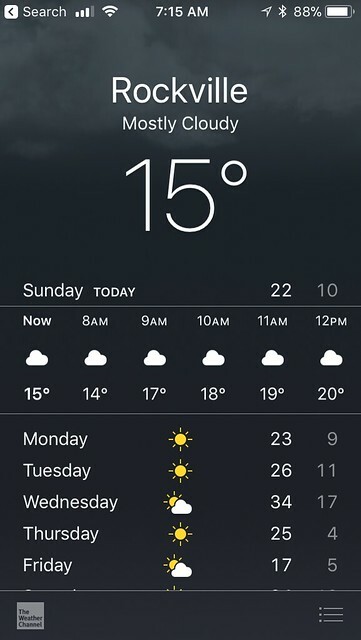 Doesn't that seem too long for meat to be warm? Like little bacteria would just take up residence and grow like crazy in your heated meat bath? 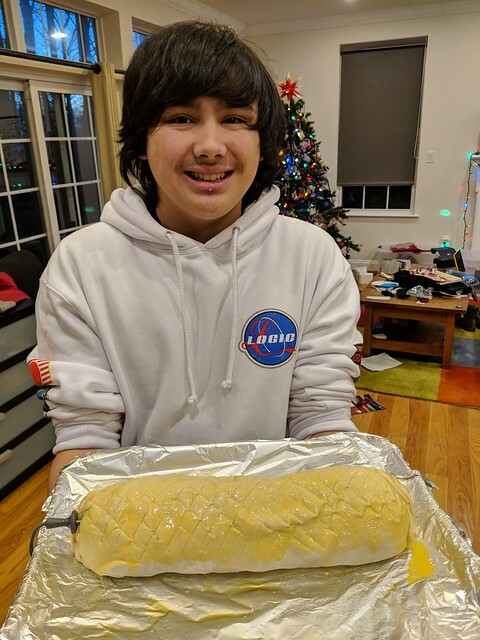 I was on the phone today with Vickey and I was telling her that Vince wanted to make beef Wellington for Christmas dinner and she suggested that we sous-vide the meat. Sous-vide means to immerse the meat in a constant temperature water bath to bring it up to the correct temperature and so instead of having a gradient of doneness in the meat where it is more brown on the outside and less done towards the center, the whole cut of meat is all at the temperature and color of, let's say, medium rare. 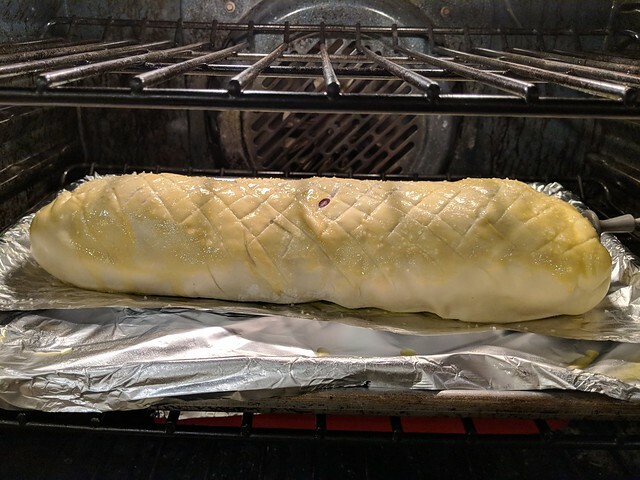 I laughed and said that beef Wellington involved coating the cut of meat with a mushroom mixture and then encase the whole thing in a puff pastry and then how could one possibly sous vide a beef Wellington? 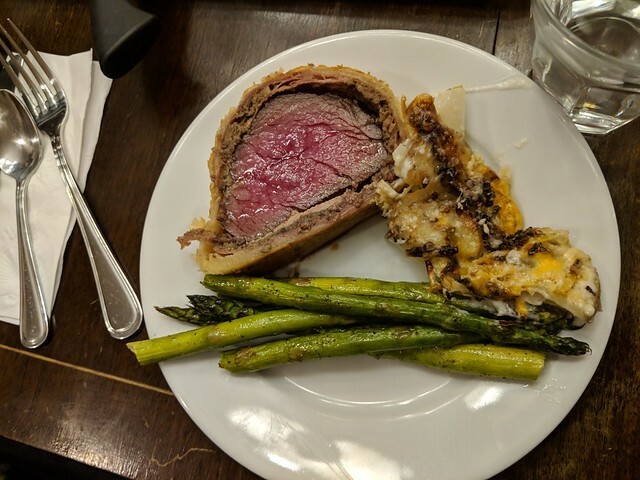 She said to sous vide the beef first and then sear it and then encase it and then put it in the oven only for as long as necessary to cook the pastry. 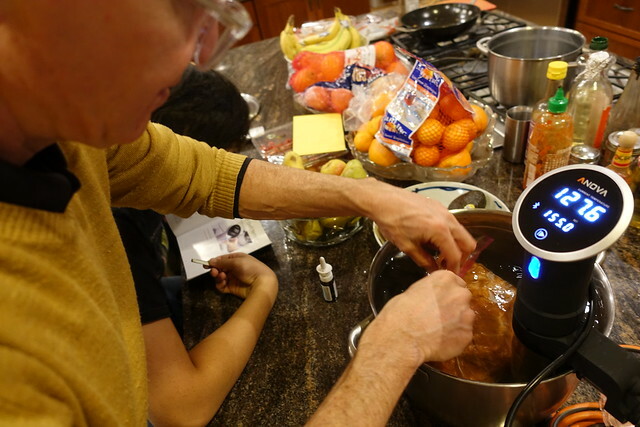 She has a sous-vide machine and said it made the most delicious meat ever. 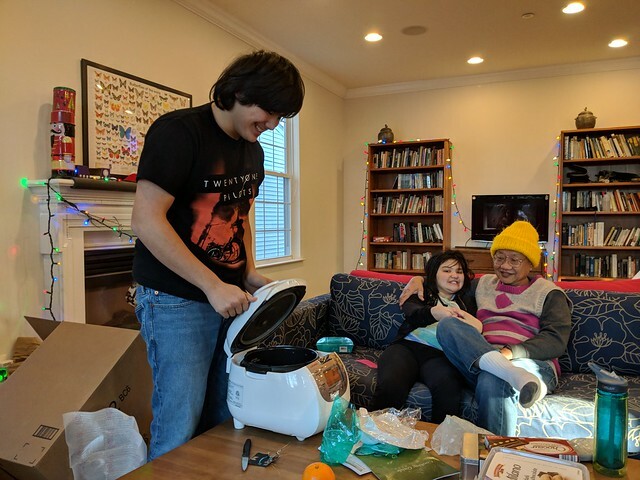 I was still skeptical - and a little unwilling to drive all the way to Virginia to borrow her sous vide-er. 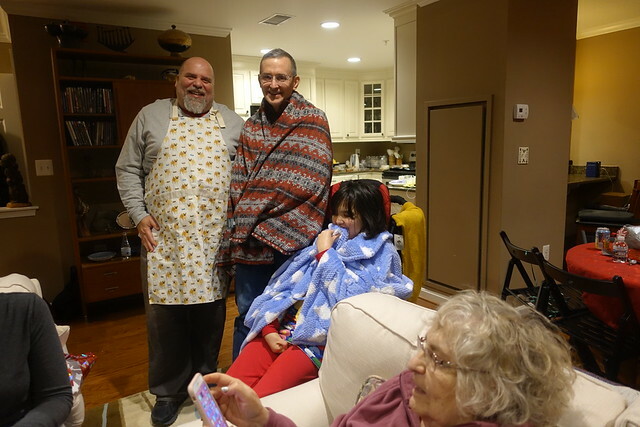 But then we were talking about it at dinner and it turns out Adriana's parents have a not-often used sous-vide-er and we had a brisket that we were suppose to make for Sunday night dinner, but didn't end up making because there wasn't enough time. So we decided to borrow Adriana's parent's sous-vider and make the brisket for tomorrow night. 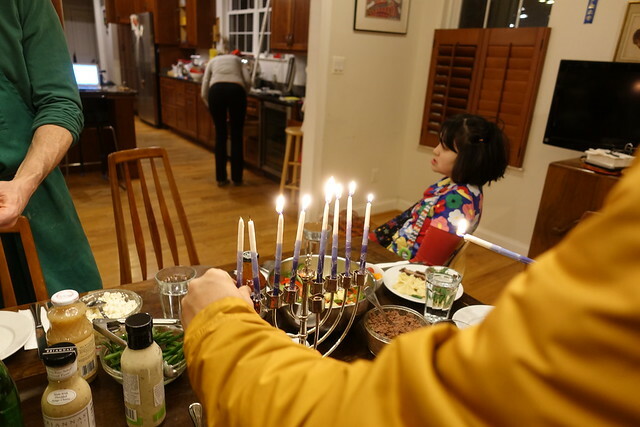 Just in time for the last night of Hanukkah. 24 hours at 155 C... we'll see how it goes. It's been a long week. Jeremy was pretty sick in the beginning. 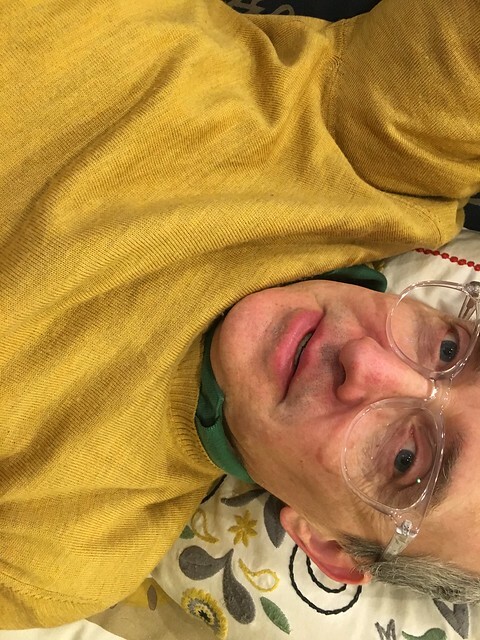 I'm still working off my cold. I've also been moody, so I start doing all the things that I know are not good for me, but feel good in the moment. Like eating a lot of sweets, spending too much time in bed sleeping and surfing the web & not talking to people. Not good. But we continue on. 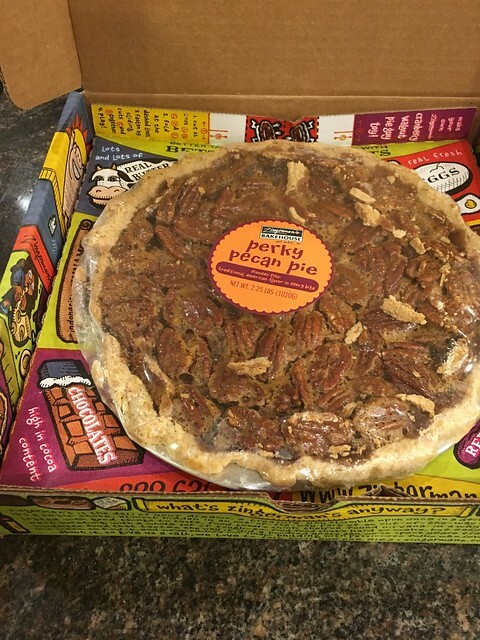 Sheila was nice to send a holiday pie - I was going to save it for Sunday night dinner, but I really couldn't resist and I opened it on Thursday and started eating many delicious slices. By Sunday night, there was about half of it left which we did serve to our Sunday night guests which was good because I weighed myself for the first time in weeks on Sunday morning and the scale definitely said that I was eating too much pie. Friday night, I went to Adriana's birthday celebration. I met some of her nursing classmates who happen to also be personal trainers at a fancy gym in Bethesda. I told them that I managed to do my first pull up a few months ago and they gave me high-5s and then I asked them what I should do next. They both laughed and said, you can't just stop at one pull up and then say you are done! You gotta do two! No, ten! You gotta work up to ten. Then after ten, you can start working on a muscle-up. 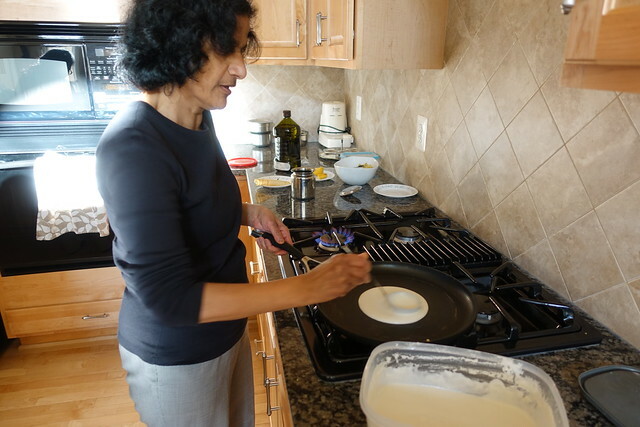 On Saturday, I spent the afternoon at Karuna's with Vickey & Satya. 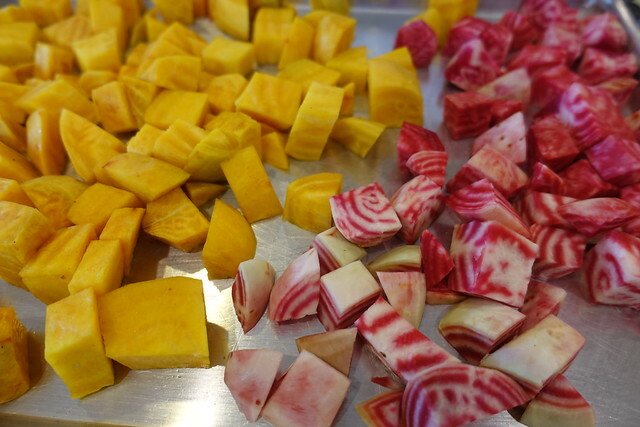 I made roasted beets - they were so beautiful when I first sliced them, but they dulled terribly when I roasted them. They tasted yummy though. 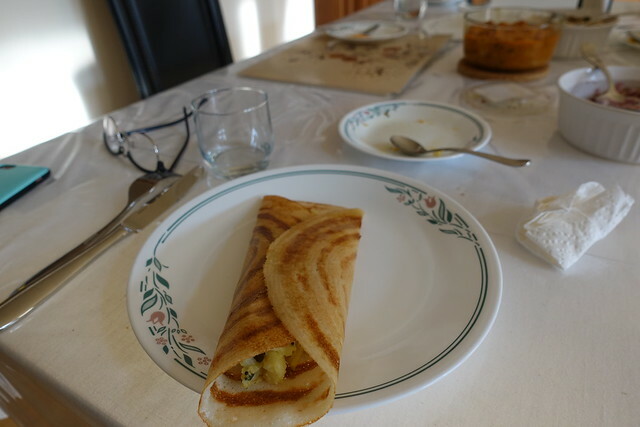 Karuna made dosas - delicious! We spent five hours eating and talking. 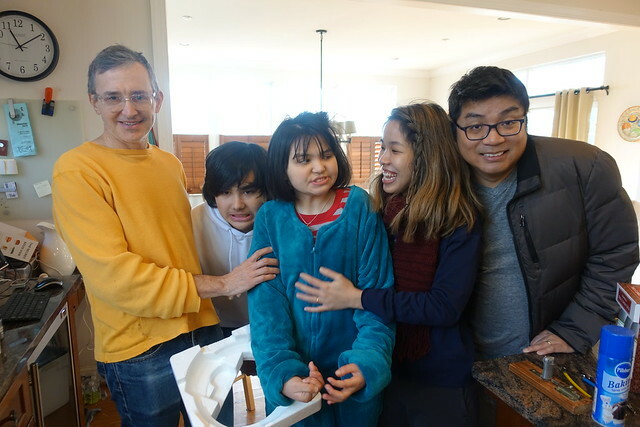 Jeremy spent the day on Saturday visiting Vidya. 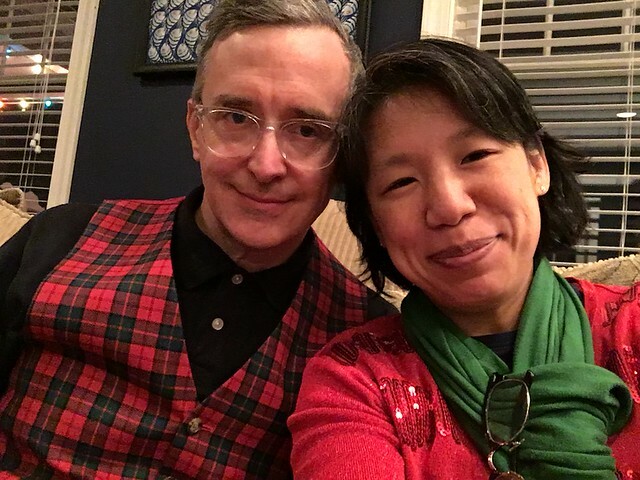 We both got home at around seven and changed into Xmas outfits to go to Jen's Christmas party. I do like this party, but I was very tired from the day and so was Jeremy so we did not stay long. Again, to manage this day, we had two sitters for Edda - Arietni in the afternoon & Adriana in the evening. Vince had some friends over in the evening, he negotiated with Adriana to order pizza for everyone for dinner. Sunday - Jeremy went on a long bike ride. He hadn't been on a bike in over two weeks with travel and being sick. 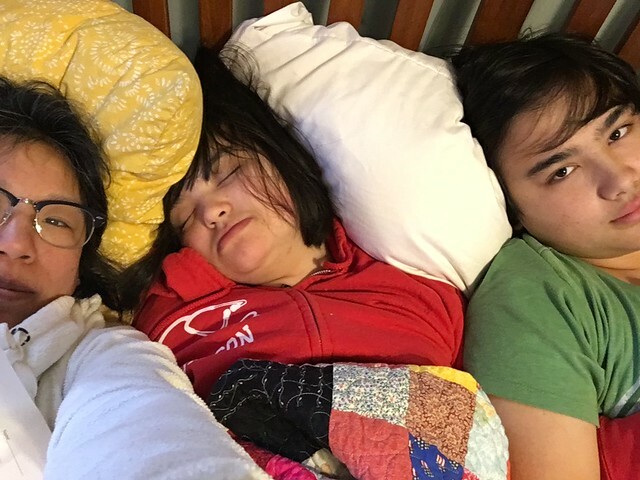 The kids and I spent the day being lazy. 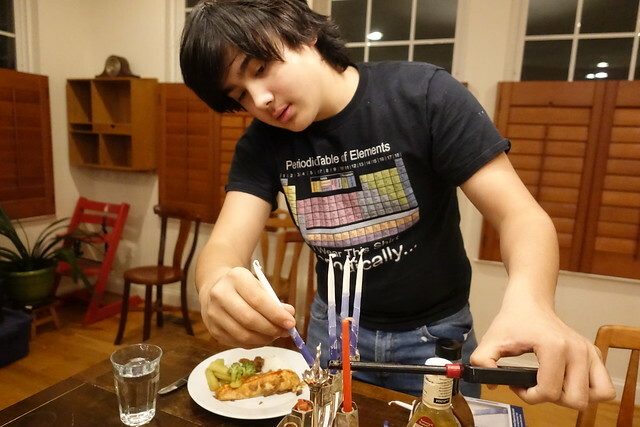 Jeremy made latkes. He didn't make it with bacon fat which is how we do it during the non-Jewish holiday time - like on a regular Wed night. My dad dropped off a cauliflower this afternoon at the house. 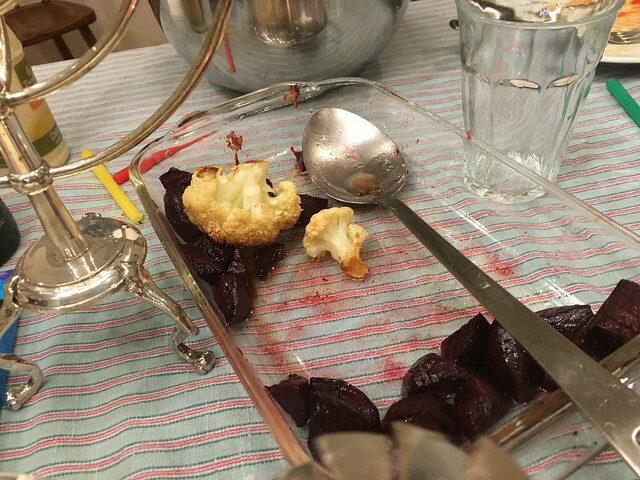 I made it (along with my favorite beets) for dinner. 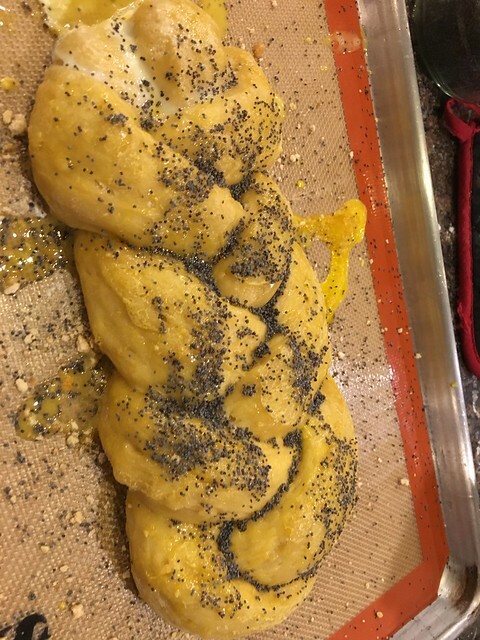 The cauliflower was suppose to go along with a casserole, but I mistimed the baking, so we had to wait an extra 20 minutes for it to finish up cooking. 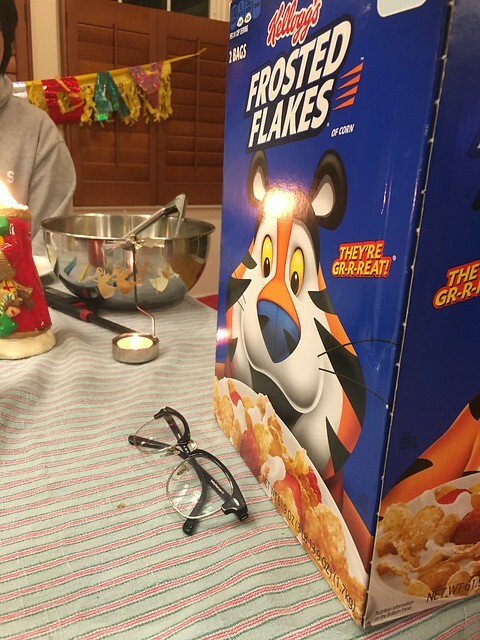 Vince proprosed we skip dinner and eat frosted flakes instead. 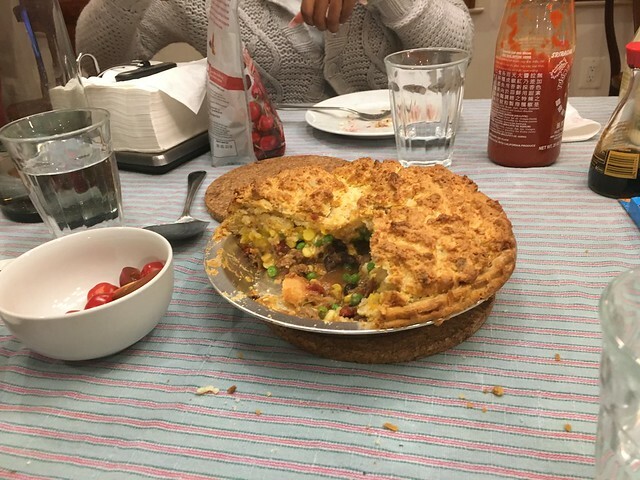 But the casserole/pie/thing-y came out just fine, we all finished off the whole thing. 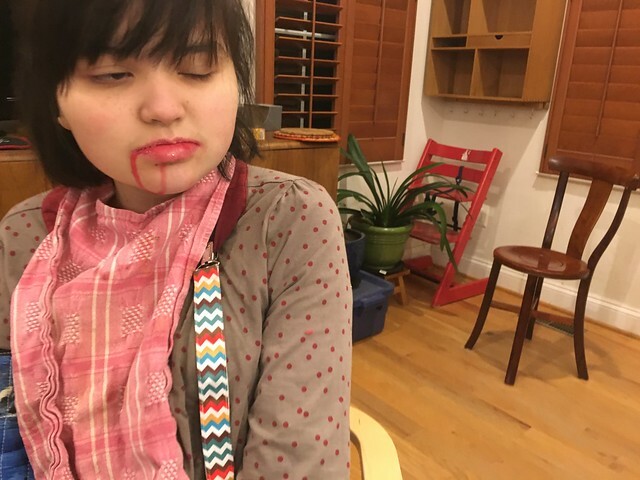 Edda had beet juice running down her chin - vampire like. Made it to the second night. Headless Santa saying hello. 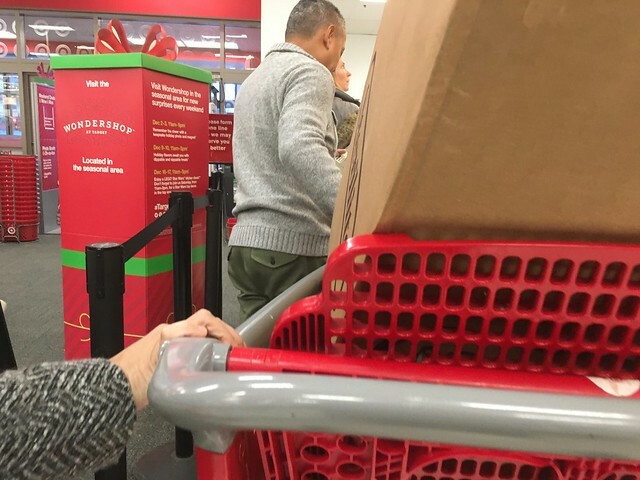 I spent time today in a line at Target procuring a hard-to-find Xmas gift. That is not my hand. 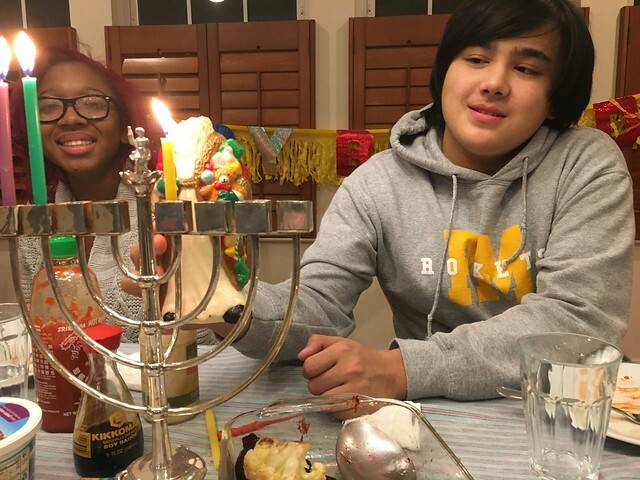 Vince pulled out the silver menorah (not too tarnished which is good because it takes a lot of time to polish it up) and lit the first candle. 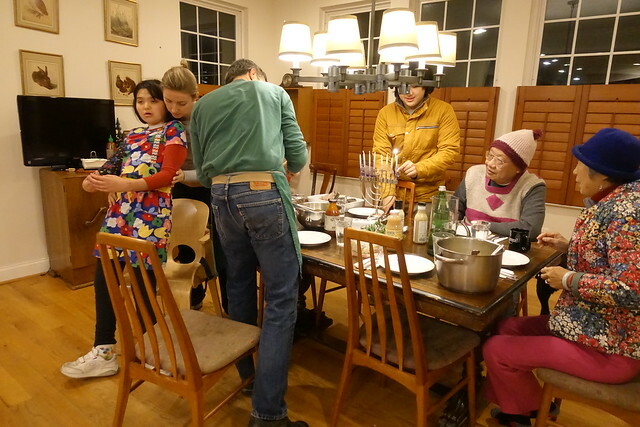 Then we discussed when we were going to make the latkes and brisket. I think we'll make them Sunday. I was on Edda duty tonight, I've mentioned before that if I outsource too much of her care, then I feel like I'm not really her mom because so much of parenting Edda is the physical part. Sick, Debbie, Usual Suspects, thank you. Great Wolf Lodge, sewing, Philly. Ning, french onion soup, pigs feet.